Dynamic public art transforms Edward R. Murrow Park and James Monroe Park. The art pieces in these two Pennsylvania Avenue parks feature energy efficient color-changing LEDs, a water-soaked prism of stainless steel mesh, and the radio recordings of Edward R. Murrow. The illuminating installations were envisioned by the Golden Triangle Business Improvement District in partnership with the DC Commission on the Arts and Humanities and National Park Service. 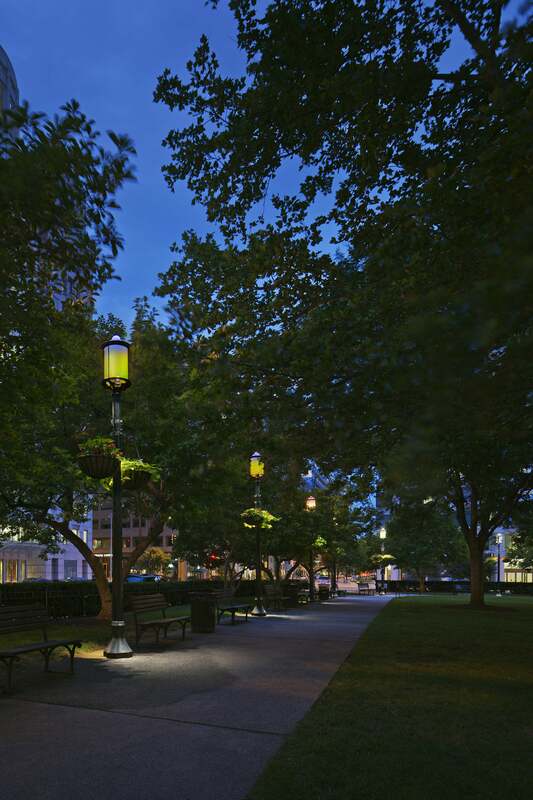 The project was designed to artistically illuminate two U.S. National Parks along Pennsylvania Avenue, create connectivity between the parks located within a block of each other, and encourage utilization of the green spaces by those who live, work, and play in the neighborhood. The art project is the first piece of a broader effort that the Golden Triangle BID is leading alongside the District government to redesign the Pennsylvania Avenue corridor west of the White House. The concept plan calls for wider sidewalks, a separated bicycle lane, rain gardens, a double row of trees, new seating, expanded parks, and free Wi-Fi. Learn more about this project. “Murrow’s Mics” transforms eight existing lanterns with color-changing LED lighting to create a striking and elegant effect. Subtle shifts in the color programming are based on World War II radio broadcast recordings of Edward R. Murrow. These recordings also impact the lighting program for James Monroe Park located a block away. “Tricorne” incorporates water, color, and optical effects to create a dynamic visual experience. A triangular prism structure created from hand woven stainless steel mesh trickles with water during the warm months and is transformed into a luminous screen at night through colorful LED lighting all year around. The work pays homage to the park’s namesake James Monroe, who was the last president to wear the three-cornered tricorne hat. It also demonstrates a playful interaction with Murrow Park down the street through the lighting programming. Washington, DC-based artist Duilio Passariello was selected for his innovative proposals for the parks. Mr. Passariello has been working with light as an artistic medium since 1979 and contributed to a number of technological advances in the field. Originally from Venezuela, he has worked on outdoor lighting projects throughout the world.